Slap me sesame, these are my new favorite thing. I have a grill at my new house and I’ve never had one of those before, so I’m generally stoked about it (I know I just ousted myself as a city girl again). Anyway, grilling is fun! Kebabs are fun! Plus, these are colorful, easy and summery. 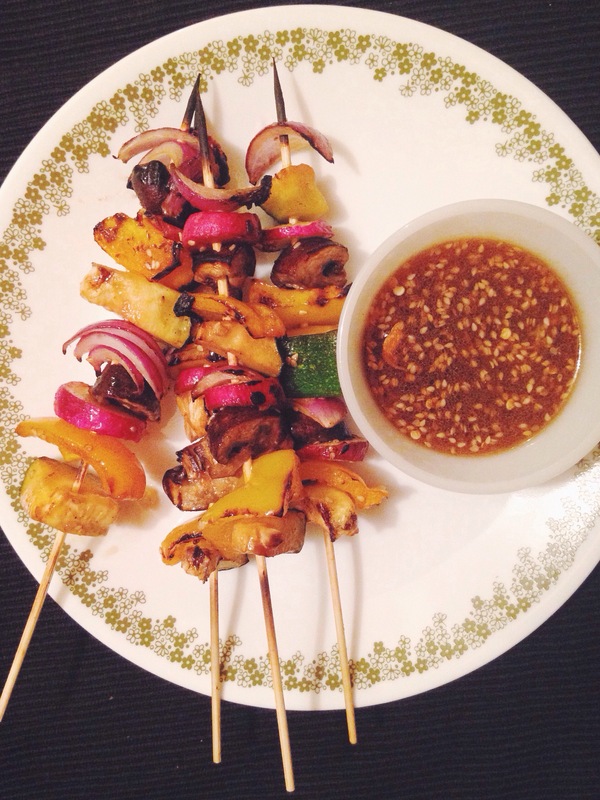 Also featuring one of my fave go-to marinades that really took the veggies to the next level. Grill master level. Pro-tip since I’m grill master now: soak your wooden skewers in water for 10 minutes before spearing and grilling, so they don’t turn black. 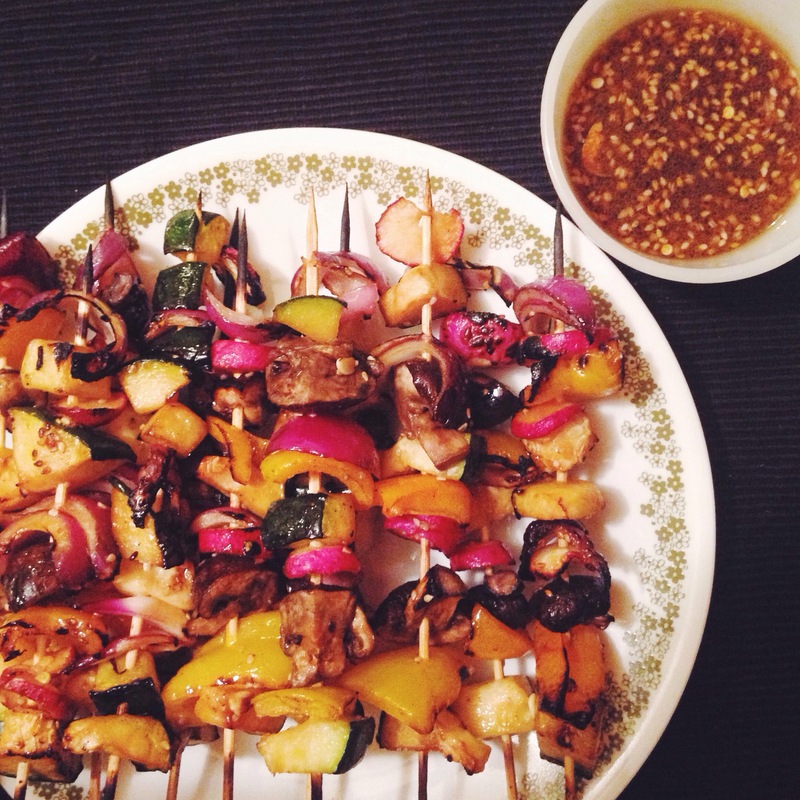 I did this but ended up using more skewers than I predicted so I had a few that weren’t soaked, and it definitely made a difference. Another tip: You’ll have quite a bit of marinade left over after this recipe, and it will be perfect in your next stir fry! Store in a jar in the fridge for a few days and whenever you need it – bam, ready-made stir-fry sauce (as in my recipe for Ginger Sesame Stir-Fry.) It’s also great as a salad dressing!! Combine the soy sauce, sesame oil, rice vinegar, agave, sriracha, garlic, ginger and sesame seeds in a measuring jug or bowl and whisk well to combine. 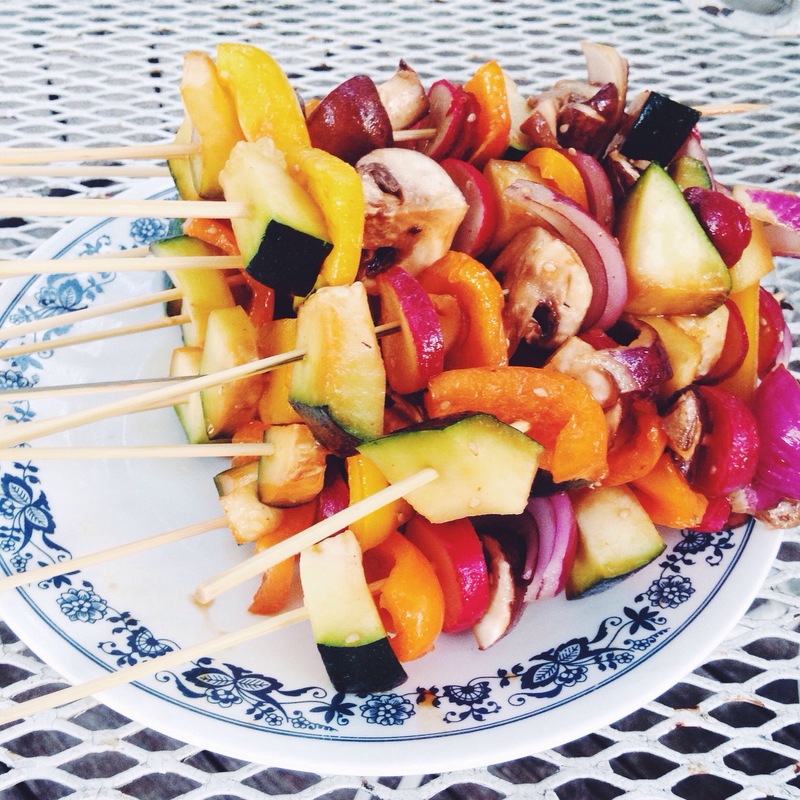 The annoying part: Chop the zucchini, peppers, mushrooms, radishes and red onion to desired skewer size: not too small – be prepared they will get a bit smaller in cooking – but not too big or you won’t have enough pieces for all the skewers. And someone will have to go hungry. Place in a large, flat baking tray or pan, keeping the vegetables separated by type. Pour the marinade over the vegetables. Cover and refrigerate for at least two hours. 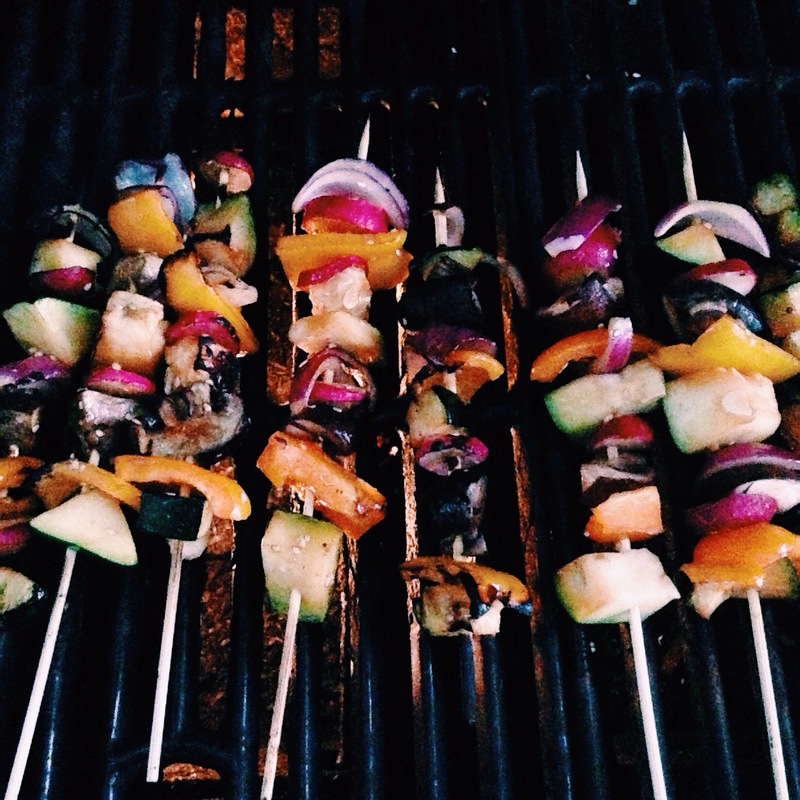 When you’re ready to get grilling, soak the skewers for 10 minutes if you’re using wooden ones. 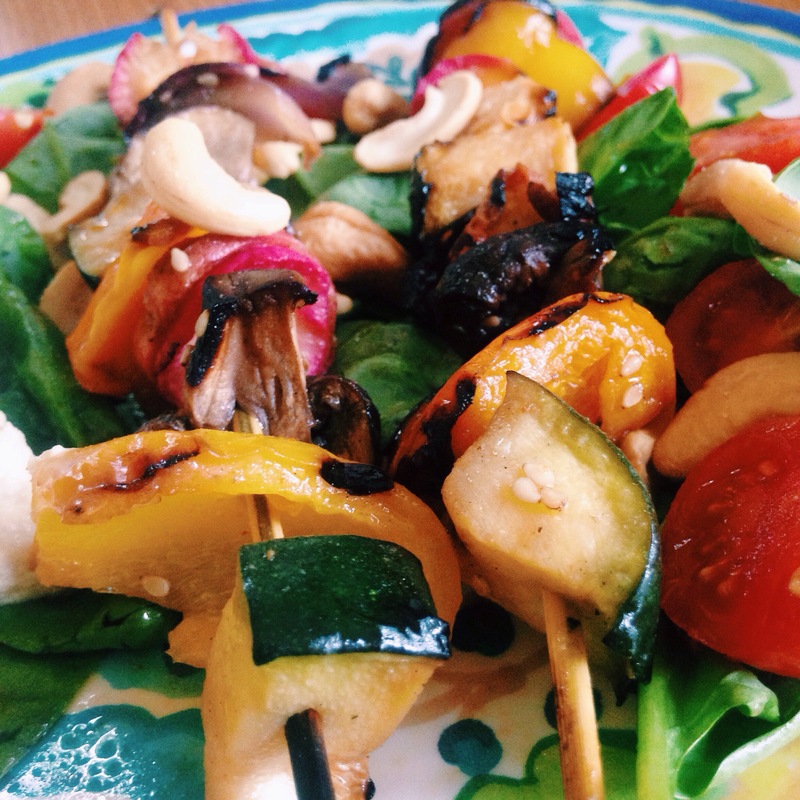 Take out the veggies and spear into the skewers in whatever order you please. I do it randomly but if you want them all the same then you do you! Now you just gotta grill them, turning them over until both sides are cooked and a bit crispy. Brush on a little more marinade as you rotate them. 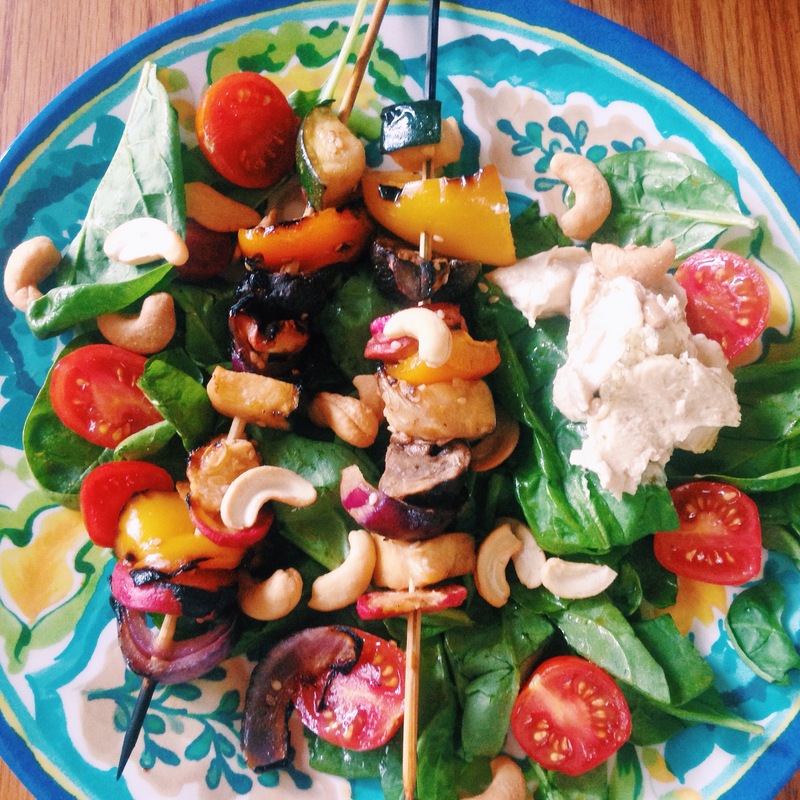 Serve over a salad dressed with a little extra of the marinade, or alone with extra marinade for dipping.